Before curtain up the audience are welcomed, by voice-over, to Fairfields Hospital and once the play begins we are greeted with the scene of Dr Farquhar's office within this hospital establishment. We are then introduced to Mark Styler, a writer of glossy 'true crime' paperbacks, who it transpires has been sat waiting for over 2 hours in an attempt to try and get an interview with one of the hospital's 'patients', Easterman, a notorious serial killer. The doctor, once he appears, seems far too uncooperative towards Styler and instantly puts you on edge, yet you can't quite figure out why. 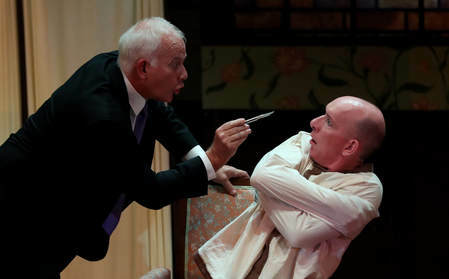 Andrew Ryan and Michael Sherwin as Styler and Farquhar certainly have some heavy dialogue in this play, yet have no problem in keeping the audience fully engrossed. There is, from the off, the wonder of whether people are really who they say they are. There's certainly a lot to be explored here: is it real, is it fantasy, how does the mind of a serial killer work and can we be manipulated to do things we don't really want to? Don't be disheartened by the fact that this play is set in just one room; there is plenty for the keen-eyed and observant to drink in amongst the clever wordplay that drives this thriller along. Framed photos, views from windows, doors and cupboards are not all that they would seem but to say any more would give the game away. By the interval the tension has risen enough for us to need to know what exactly Styler has got himself into. Sarah Wynne Kordas when she finally turns up as Nurse Paisley helps to keep tensions rising. 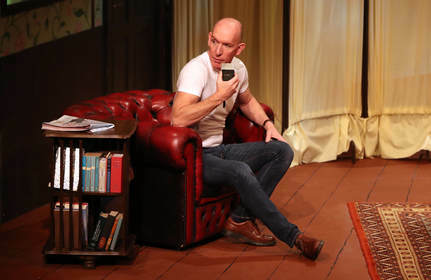 Despite being a thriller, there are plenty of humorous moments in this play and references to modern day life such as Ryvitas and Marks and Spencers provide a reality through the obscurity of what is happening on stage. When Farquhar grimly persuades Styler to put on a straightjacket you sense it's not going to end well yet you can't help but smile at his line, "A man wearing a straightjacket can only be one of two things - a failed escapologist, or a madman." With plenty of twists and turns that will keep you on your toes, this play is a fabulously entertaining, well performed and directed piece of theatre; it will take you on a journey that somehow doesn't really end and if you don't really 'get it' by the time the curtain comes down, then I actually think that Mindgame has done what it set out to achieve. Last night I was fortunate to see Anthony Horowitz’s Mindgame. A play based in an asylum named Fairfields holding serial killer Easterman. This was a thoroughly entertaining evening with many surprises and twists along the way. The actor who played Mark Styler was brilliant and I particularly liked the staging, especially the brick wall being built and the use of the music from Pink Floyd’s Dark Side of the Moon. I would certainly recommend a visit to the theatre to see this production.